Green Connections - Palmstead's Soft Landscaping Workshop - is a one-day seminar and discussion forum on topics relating to the Landscape Industry. Green Connections - Palmstead's Soft Landscaping Workshop - is a one-day seminar and discussion forum on topics relating to the Landscape Industry. Delegates are drawn from the interconnecting worlds of landscape architecture, garden design, landscape contracting and green space management. 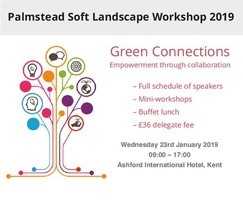 A stimulating line-up of speakers has been arranged to discuss 'Green Connections' and how we can benefit from applying this philosophy to our internal connections within the industry, empowering ourselves through collaboration. A number of mini workshops will be taking place during the day, some designed to impart practical advice and led by key figures in their respective areas, and others led by representatives of horticultural organisations who will be explaining why being a member of an organisation is so important to developing connections within the industry. A large number of companies from across the industry will be exhibiting on the day. Wednesday 23 January 2019 - 09:00-17:00. Held at its traditional venue, the Ashford International Hotel in Ashford, Kent. The delegate fee, which includes a buffet lunch and refreshments, costs just £36 + VAT. For delegates travelling by rail, there will be a shuttle bus meeting the fast train from London St Pancras to transfer to the venue and back.